We are informing applicants that the official notification regarding the recruitment of Sub Inspector in Odisha Police Department will be released soon. The notification regarding the Odisha Police SI Recruitment 2019 will soon be available. This vacancy is the great opportunity for all aspirants who want to get a government job. They can fulfill their dreams. The vacancy will be declared in the upcoming few days. As of now, no official date has been provided by the recruitment board for the release date of it. Odisha Police Vacancy will be released within few months. We will provide you regular updates about it here on this page. You guys just have to keep visiting us here on this page regularly and you will not miss anything important detail about it. Odisha Police SI Recruitment will be available to candidates very soon. Candidates need not to worry much. Odisha Police SI Vacancy will be released in the later months of this year. The candidates are waiting for it very eagerly. You will be notified about it as soon as the official notification regarding Police Vacancy will be declared. The recruitment board will soon provide the officially confirmed date for it. The candidates will soon receive the official notification regarding Odisha Police Recruitment . The notification will be released on the official website. The link is available in the below section. If any information will be available regarding Odisha Police SI Vacancy 2019, you will be informed here before everyone else. 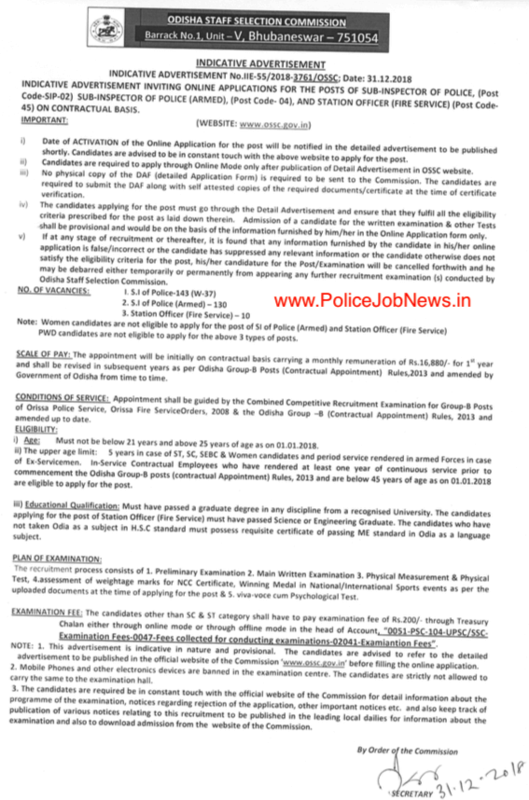 Latest Update (12 Feb 2019): Odisha Staff Selection Commission (OSSC) has released short notice about Odisha Police SI Recruitment 2019. They have mentioned no of vacanies i.e. 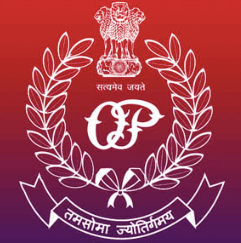 283 SI Posts.You may download Odisha Police SI 2019 Notification PDF from below given link. Online form will start at later stage. At present No Fixed date is given by OSSC. But we are expecting that online application will start in Feb month. You need to stay tuned with us for latest updates about OSSC SI Recruitment 2019. A candidates must be graduate in any discipline from any recognized University. Be of sound health and physic. Not have more than one spouse alive. Be able to speak, read, & write Odia. Have passed M.E. School or higher examination with Odia language as a subject or passed HSC or equivalent examination with Odia as a medium of examination in non language subjects or passed the written test in Odia in M.E. School Standaed conducted by Education Department of State Government. Choose the Online Registration Section. The online application form will be available here. Odisha Police SI Application Form will be available in this section. Fill all the available columns in the form. Now, you have to submit the filled Online Form. Take out a printout copy of your application form. You have to keep it safe with yourself. If you want to apply for Odisha SI Recruitment, visit the official website. We have already provided you the link to the official website in the above section. You just have to follow that link to download it. We have already provided you the method to fill the online application form in the above section. Odisha SI Vacancy 2019 will be released shortly. If you still have any doubts regarding Odisha Police SI Recruitment, contact us. We will surely help you. Drop your questions in the comments section. We will surely help you out. Odisha police department regularly iregular jay ho police department.are Bhala ra exam ta ta Kara.4 to 5 year kahike lagau6a pilanka carear Katha .jay hind.